This course is targeted at students 12 to 16 years old who wish to gain entrance into Singapore Government Schools through the various examinations held by MOE and individual schools. The course aims to equip students with the skills and knowledge of the Singapore syllabus, mainly English and Mathematics. This module covers the topics as per MOE Syllabus for the respective level. It is mainly to help students build up a very strong foundation for further studies. 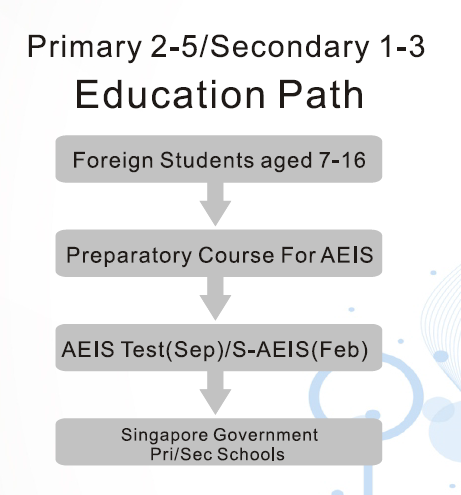 Students who pass the respective AEIS or S-AEIS Examination can gain entry into Singapore Government Schools. Final assessment is based on written examinations set by the Ministry of Education Singapore. Internal assessments include Mock Examinations and monthly progressive tests. Students are deemed graduated when they have completed the course with at least 90% attendance for international students and 75% attendance for local students. All Student Pass Holders are required to maintain a record of 90% and above. Failure to do so may lead to cancellation of student pass. Non-Student Pass Holders are required to maintain a record of 75% and above. Failure to do so may result in suspension or termination of the student. Upon graduation, students will be awarded a Statement of Achievement.